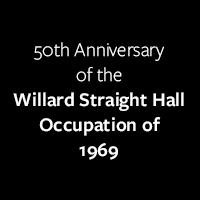 The Cornell community will mark the 50th anniversary of the occupation of Willard Straight Hall with a film screening of Agents of Change. This film captures the well-publicized events at San Francisco State College in 1968 and the occupation of the student union at Cornell in 1969. The struggle for a more relevant and meaningful education, including demands for black and ethnic studies programs, became a clarion call across the country in the late 1960s. Through the stories of these young men and women who were at the forefront of these efforts, Agents of Change examines the untold story of the racial conditions on college campuses and in the country that led to these protests. Filmmakers Frank Dawson ’72, who participated in the occupation of Willard Straight Hall, and Abby Ginzberg ’71 will be in attendance for a Q&A after the screening. This event is a partnership between Cornell University, Cinemapolis and The History Center in Tompkins County.